Maharao Balwant Singh started the construction of Garh Palace in Bundi. The Garh Palace is the complex of numerous palaces which were built by rulers of different times. Most of the palaces were built between the 17th and 18th centuries. After a long period of neglection Garh palace again gaining its recognition. Garh Palace is known for its artistic Rajput style architecture which can be easily seen in its Jharokhas and pillars. Among other palaces which are famous for their decoration like Chhatra Mahal, Phool Mahal and Badal Mahal, there is a somewhat separate Ummed Mahal, famously known as ‘Chitrashala‘. Chitrashala has fascinating pavilion and a gallery of miniature murals located on a raised platform above a garden platform. It has entrance from other side and no entry fee with 8 am to 5 pm timings. 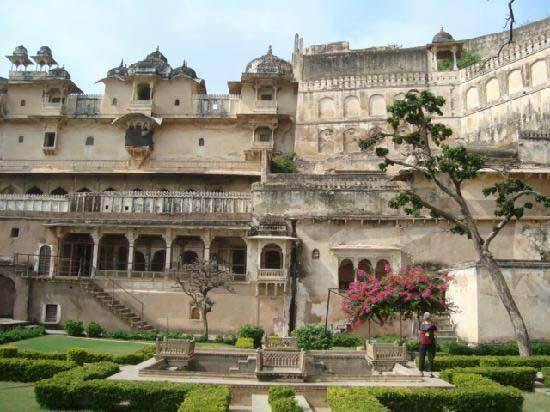 By Road: Garh Palace is located at the outskirt of Bundi town near Sadar Bazaar. One can easily reach here by local bus or local taxi, rickshaw or walk. By Rail: Garh Palace is well connected through nearest Bundi Railway station ( 9 km) to major cities railway stations like Delhi, Agra, Mumbai, Chennai, Bundi, Pali, Jaipur, Ahmedabad. By Air: Garh Palace can be reach through nearest Jaipur Airport (215 Km) which is well connected with regular domestic flights to Delhi, Mumbai.